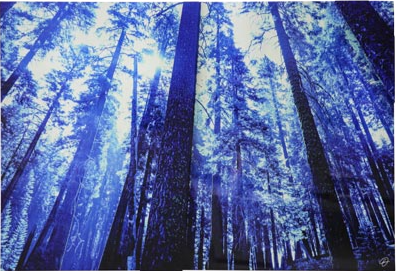 The Enchanted Forest is an amazing 3-D artwork. It is a wall sculpture in aluminum made of 4 overlap panels. Wisdom, strength, mystery. A wood of sequoia recalls the best part of the human soul, its depth, the positive vision of existence, the exchange of energy between generations. Older trees give way to new ones, others affected by lightning and misadventures provide sap for new life. The immensity of these plants mixes with the light, absorbs it and exalts it. If you look up you find the door to infinity, dreams have no limits.